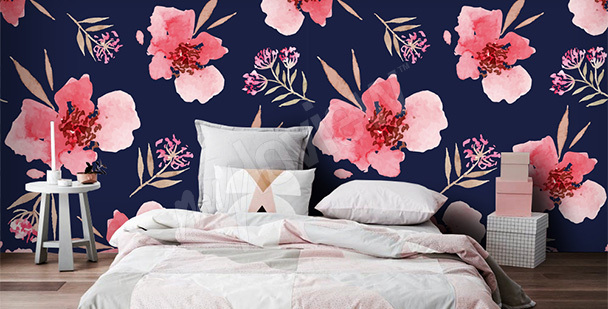 Flower wallpapers will be a graceful and colorful decoration of interiors arranged in various styles - from classic and elegant - to rustic and romantic. 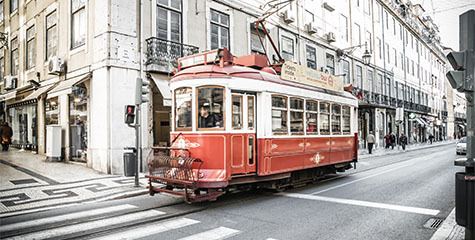 A subtle motif will bring lightness, color and sophistication into your interior. A photographic detail will emphasize the beauty of pastel accessories and glass accents - vases and candle holders. In our collection, you will find flower wallpapers in various versions - from effective photographs with an orchid to climatic compositions with roses, tulips and lavender. A flowery accent will instantly improve your interior. Thanks to the plurality of patterns and motifs, you will surely find a wall decoration that will perfectly fit into your decor and emphasize its character. This design is ideal, for example, for a woman's bedroom – it will emphasize the romantic style of the interior and give it a light feel. 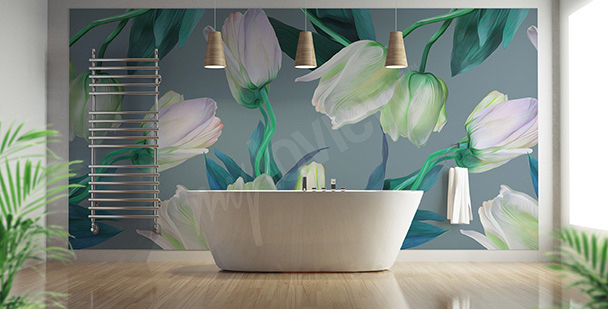 A flower design works not only in the living room and bedroom, but also in the bathroom. 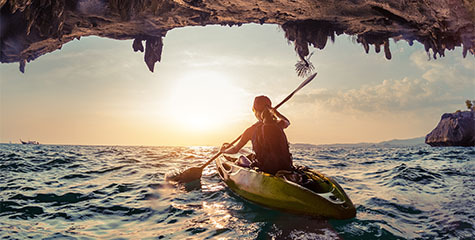 It will turn it into your private spa! 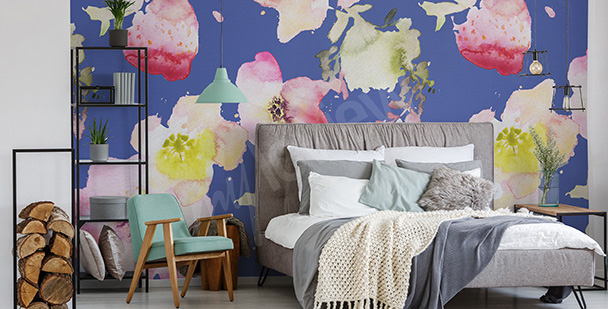 Floral murals on the walls of the office will help you relax and rest tired eyes. This pattern works just as well in the living room. This spring flower motif brings peace and harmony to the interior. 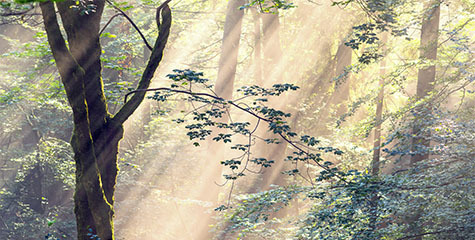 Let yourself be enchanted by its beauty and use it to decorate your living room. 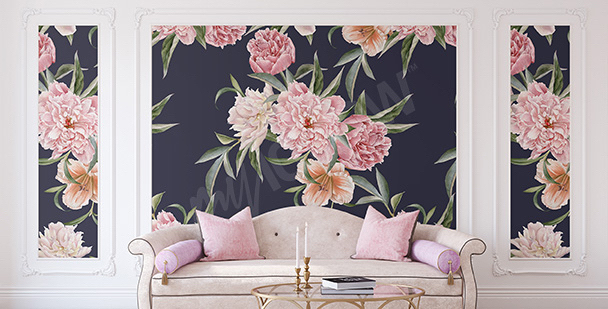 If you want your living room to gain a timeless, elegant look, opt for a tasteful mural featuring peonies. 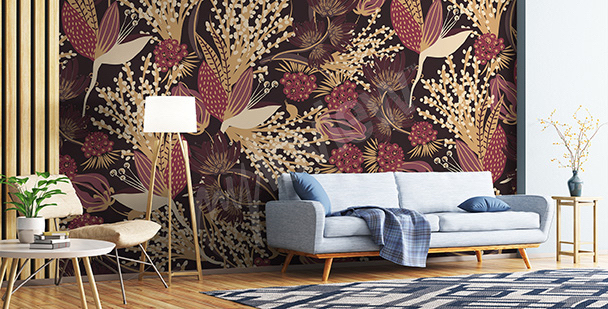 A mural featuring flowers in autumnal colors is a perfect fit for a room decorated in light, natural colors. An original floral design applied to one of the walls is a quick way to achieve a complete makeover of the interior. The bedroom surrounded by beautiful flowers will make your daily rest more comfortable. 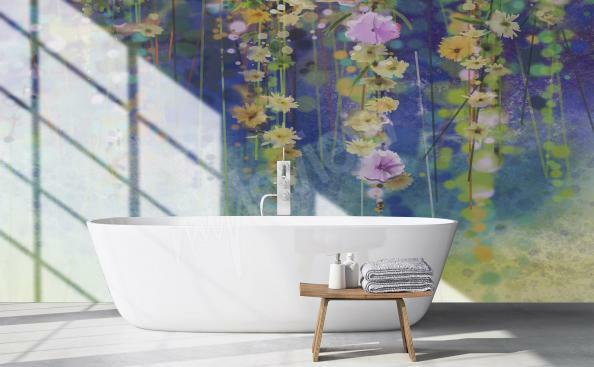 An expressive mural with wild flowers in retro version will perfectly fit a strong decor and will bring some color into you space. 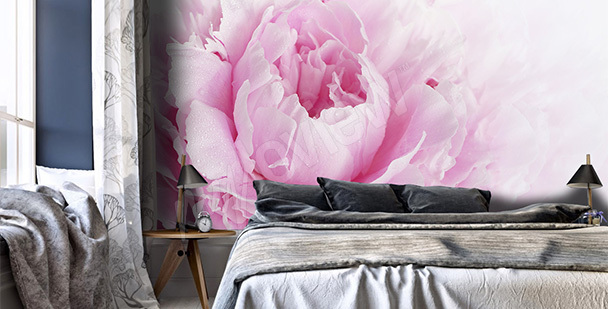 A decor of feminine interiors will gain an idyllic character if you’ll decorate the walls with a mural with a pink peony flower. 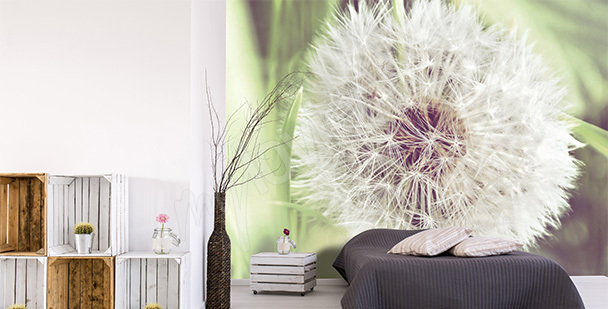 A light motif of a dandelion on a mural is a perfect complement of a decor in minimalist or Scandinavian style. If the world of nature is important to you, opt for a decorative floral motif that brings a carefree springtime to mind. To decorate an interior dominated by white accents, chic forms and subtle accessories, you can use flower murals with magnolia. Such composition will add an ethereal and delicate look to a bright decor - it will emphasize the beauty of flower designs, aesthetically profiled details and elegant decorations. Flower pattern wallpapers with a picturesque landscape in the back will be a beautiful background for wooden elements, upholstered furniture in cream color and a modern, glass coffee table. White tulips can be used in a stylish bedroom - they will be a perfect complement of chic textiles - linens, curtains and bed throws. 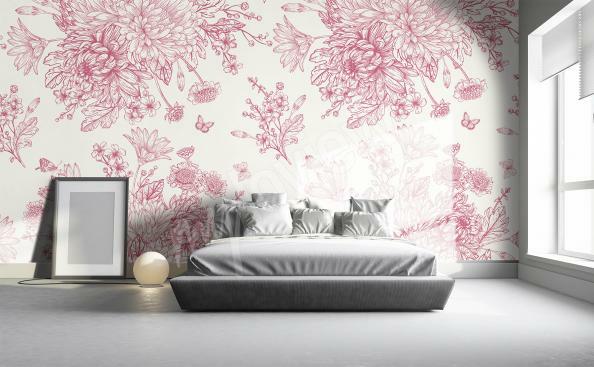 Wallpaper spring flowers will emphasize the style dominated by toned, classic colors. Wall decorations will make a dining room, living room, a woman’s office and bedroom look more attractive. 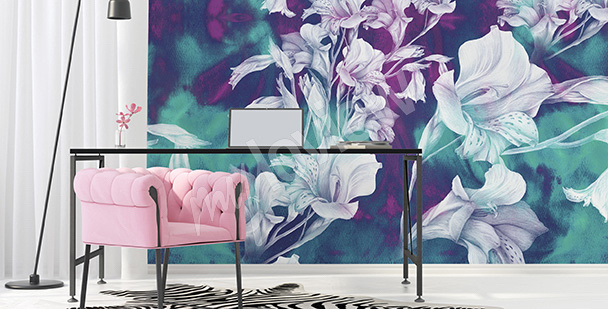 In our collection, you will find wonderful flower wallpapers in various versions - a photograph with and orchid will work well in a modern interior dominated by modernistic and elegant decorative solutions. 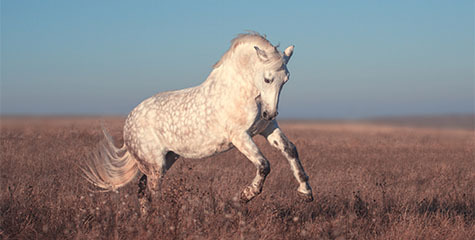 A decorative accent can be combined with white and brown, and with accessories inspired by nature. An orchid can be successfully implemented into a kitchen space. Flower pattern wallpapers for kitchen will be an expressive accent, and when combined with white, modern fronts, they will create an intriguing contrast. Rose flowers wallpapers will look beautiful not only in classic arrangements, but also in a space decorated in a romantic style and glamour atmosphere. Artful wall decorations with rose petals can be used in a bathroom - they will be an expressive background for a ceramic, oval bathtub. 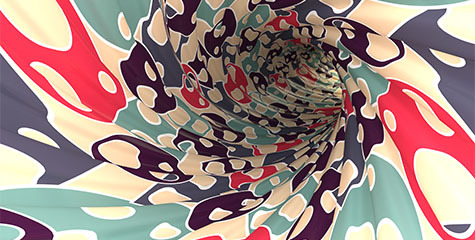 3d flower wallpapers will create a pleasant atmosphere within your interior. And it will encourage evening baths and an effective relaxation at home. Flower wallpaper can be found in various color versions - a red flower will give your interiors an expressive look and will emphasize ruby features of your decor. A composition with white roses will make a room look chic - it will be a beautiful complement of a bright corner sofa in a modern living room, and a chic bed in a romantic bedroom. Pastel retro flower wallpapers can be successfully used to decorate interiors kept in vintage stylistics. 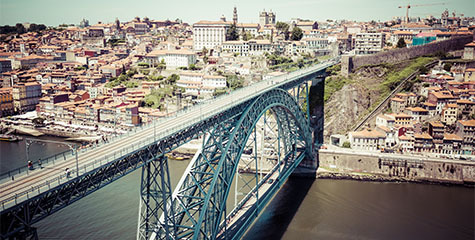 Photographs will give your interior a bit of optimism, happiness and positive energy. In a vintage arrangement one can implement a wallpaper spring flowers with colorful tulips, lilac and daisies. Wallpapers with flowers will be a great decoration for interiors kept in rustic style. Photographic accents will become a wonderful background for wickerwork chairs, wooden antique furnitures and plant accents. 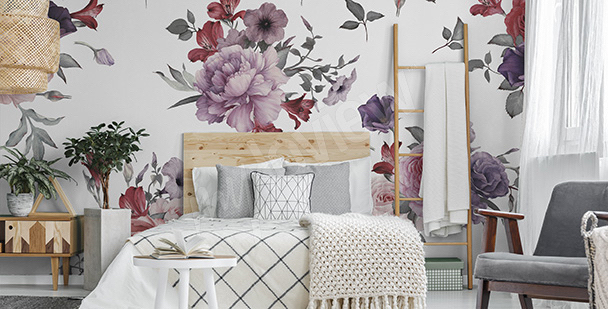 Flowers wallpapers will go nicely with elements made of natural materials - they will freshen up an interior and will give it an inspiring look. 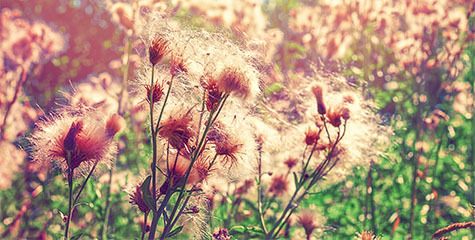 Spring flower wallpapers can be successfully used to decorate a rustic living room. In our collection you can find cheerful landscapes with sunflowers, a meadow and pictures of poppies. 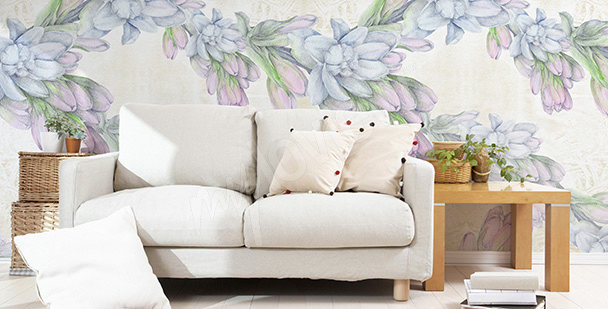 With help of a fancy mural flowers you will make your living room look cosy and gain on a summer atmosphere. Such murals will also look great in a bathroom. For decoration of a bathroom, we suggest watercolor styled wallpaper spring flowers. Lavender can be used to decorate interiors kept in a Provencal style. 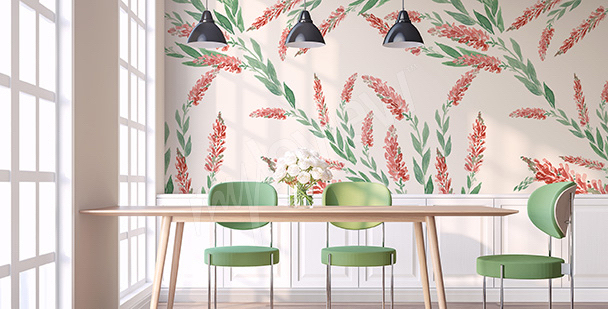 An interior inspired by the south of France will gain an effective and charming complement in form of a graceful, flowery accent if you’ll apply a flower wallpaper onto the wall in your living room. 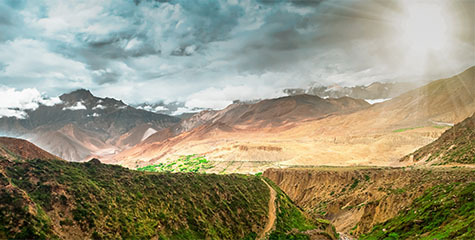 A picturesque landscape will bring magic, fantasy and nostalgia into your living space - a wall decoration will create a wonderful atmosphere and will emphasize the beauty of accessories in your interior. 3d flower wallpaper with lavender motif will become an expressive photographic accent - they will emphasize the beauty of white, carved furniture, openwork details, atmospheric lanterns and ceramic candle holders. A Provencal motif can also be used in a kitchen space - a flower pattern wallpaper for kitchen with lavender design will look great between glass cabinets and a wooden sideboard.